In the state’s ongoing effort to combat the spread of invasive zebra mussels, new rules have taken effect requiring that all boats operating on public water in 17 Northeast Texas counties be drained after use. Under the new regulations, persons leaving or approaching public water in the affected counties are required to drain all water from their vessels and on-board receptacles. This applies to all types and sizes of boats whether powered or not, personal watercraft, sailboats, or any other vessel used to travel on public waters. The rules apply on all public waters in Collin, Cooke, Dallas, Denton, Fannin, Grayson, Hood, Jack, Kaufman, Montague, Palo Pinto, Parker, Rockwall, Stephens, Tarrant, Wise, and Young counties. Anglers are allowed to transport and use commercially purchased live bait in water provided they have a receipt that identifies the source of the bait. Any live bait purchased from a location on or adjacent to a public water body that is transported in water from that water body could be used as bait only on that same water body. Movement from one access point to another on the same lake during the same day does not require drainage and there is an exception for governmental activities and emergencies. Marine sanitary systems are not covered by the new regulations. Zebra mussels became established in Texas in Lake Texoma in 2009. Last year, they were found in Lake Ray Roberts and the Elm Fork of the Trinity River. 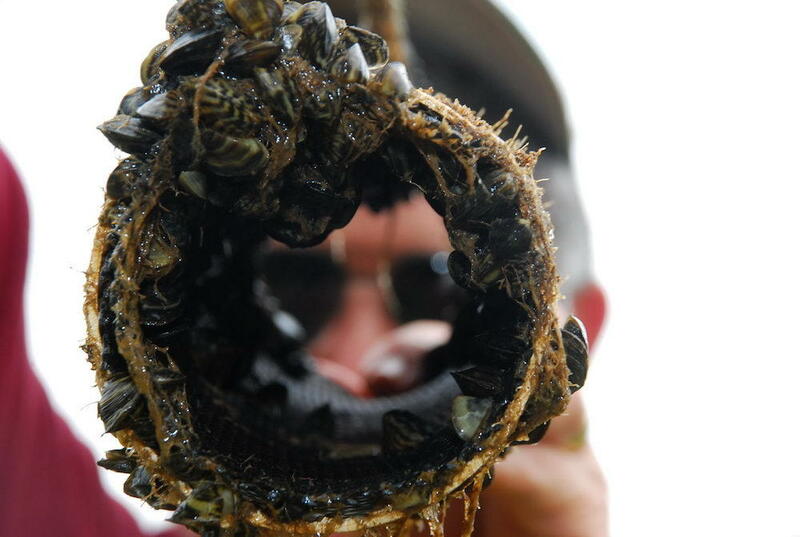 More recently, zebra mussels have spread to Lakes Bridgeport, Lewisville, and Belton. They can expand their range even farther by hitching a ride on trailered boats that have been immersed or moored in waters where they have established populations. The rapidly reproducing mussels, originally from Eurasia, can have serious economic and recreational impact on Texas reservoirs. They can clog public-water intake pipes, harm boats and motors left in infested waters by covering boat hulls, clog water-cooling systems, annoy boat-dock owners by completely covering anything left under water, and make water recreation hazardous because of their sharp edges. From an environmental perspective, zebra mussels are filter feeders, which means they compete with baitfish such as shad for available forage. Any impact on baitfish in turn can affect their predators which are game fish such as bass, striped bass and catfish. Zebra mussels also threaten native mussel populations because they will colonize on their shells and essentially suffocate them.